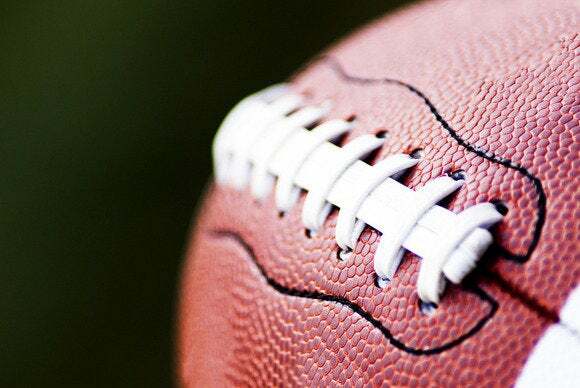 Rarely is watching the Super Bowl a solitary experience—usually, you and your buddies are crammed into someone's living room, huddled around the snack table and shouting at the TV with every play. So, if the party gets a little too hectic, you might need some apps to help you refocus on the game. These apps will enhance your Super Bowl viewing experience, helping you keep up with the action and providing a distraction during the ridiculously long halftime show (you know, if Katy Perry isn't your thing). If you want to stream the game, you’ll need to get NBC Sports Live Extra (free; iPhone and iPad), the official streaming service of NBC Sports. NBC Sports Extra is again streaming the Super Bowl live. However, this isn't an option for cord-cutters: you’ll need to sign in to the app via your cable, satellite, or broadband provider. Most of the major and other regional providers are supported, so you shouldn’t run into issues—as long as you don’t wait until kickoff to start scrambling to find your username and password. Do yourself a favor and make sure everything is ready to go beforehand. 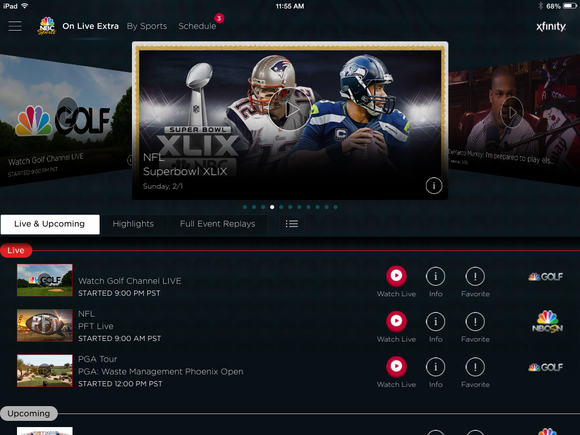 The NFL has again put the official Super Bowl Program ($2; iPad) in the App Store. It's $2, but that's still several dollars less than what those attending the game will pay for the published version. Plus, this one is filled with multimedia features, like digital player cards, videos, and an interactive seating chart. It’s a great buy, and it’s tied to your iTunes account, so it’s always yours for when you switch devices in the future. 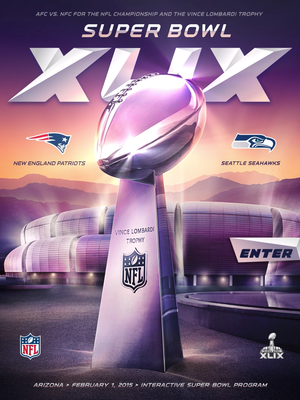 For $2 you can get a digital version of the official Super Bowl program. Another neat addition is the ability to check out programs from past Super Bowls. For $1 a piece, you can grab one of several editions going back to Super Bowl XXXIX. The app also connects you to the NFL's online merchandise store, which will probably tempt you if you’re a Patriots or Seahawks fan and your team wins the game. Madden NFL Mobile (free; iPhone and iPad) is perfect if you’re in the mood for more football, but you want direct control over the outcome. You can sync up the game's status, set your preferences, and earn additional goodies (you’ll need them with all those in-app upgrades) if you connect to the app via Facebook. 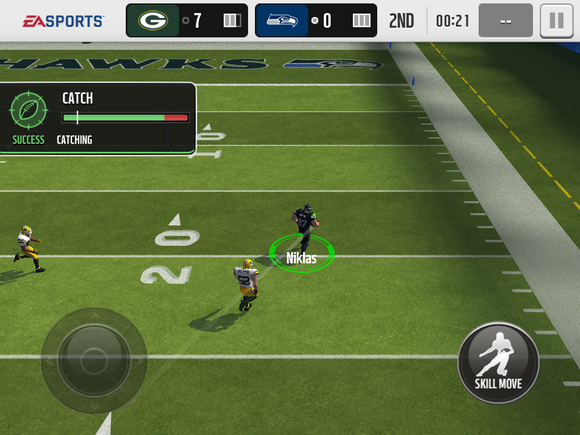 Madden NFL Mobile is loaded up with in-app purchases, but it's still fun to play. The gameplay is pretty smooth—a virtual joystick handles the main control, you tap specific players to start playing as that player, and then hit the other buttons to perform skill moves. There's an option for calling up the play diagram before it starts so you can know who to throw the ball toward. Overall, it's a sized-down version of the popular console franchise that should serve you well if you want a break from the TV. 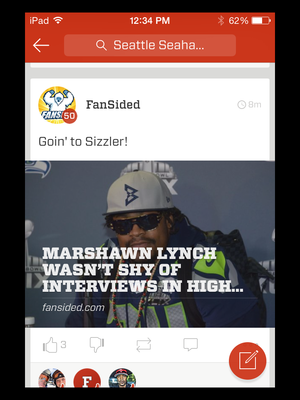 Fancred (free; iPhone) is a social network that is 100-percent directed at sports. You curate your own stream to follow based around your favorite teams or events. Then, the online banter begins, as other users post and share their thoughts about what went down that day. Fancred is an online social network dedicated to sports news and opinion posts. You'll see a particularly high uptick in conversation right now with this being Super Bowl week, so I would imagine the network will be rather packed on game day. It’s iPhone only for now, but its concept of honing in on online conversation around a focused topic helps you avoid getting lost in the flow of Facebook. Instead of over-indulging on the beer at your Super Bowl bash, why not devour video and other content served up by another official app, NFL Mobile (free; iPhone and iPad). It has an event map and info about the goings-on at the University of Phoenix Stadium, so you can get a feel for what it would be like to spend thousands of dollars and attend the game in person. 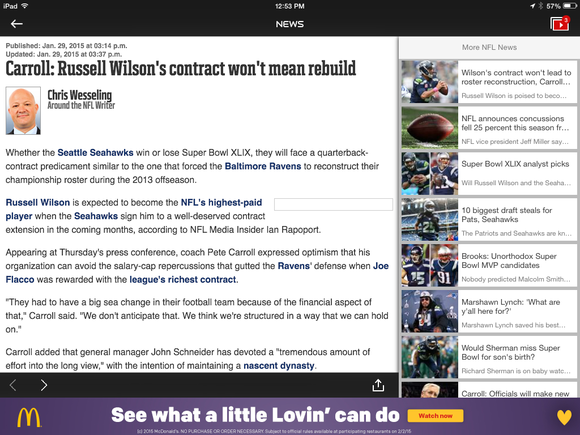 NFL Mobile is a hub of articles and videos about everything going on with the league. It's even better if you're a Verizon subscriber, as the carrier has exclusive rights to broadcast live games during the regular season. You also get NFL Network and NFL Redzone, which skips around on game day to where the most compelling action is. Keep this one around for next season if this is the kind of content you want. If you’re a Seahawks or Patriots fan, you may want to grab the official team apps. Along with the usual smorgasbord of team news and videos, the Seahawks (free; iPhone and iPad) and Patriots (free; iPhone) apps will bug you with push notifications to keep you updated when something major takes place. Following the NFL is practically a year-round activity, so don't delete these apps just yet—keep them around to stay on top of the upcoming draft and the usual chess game of off-season maneuvers.